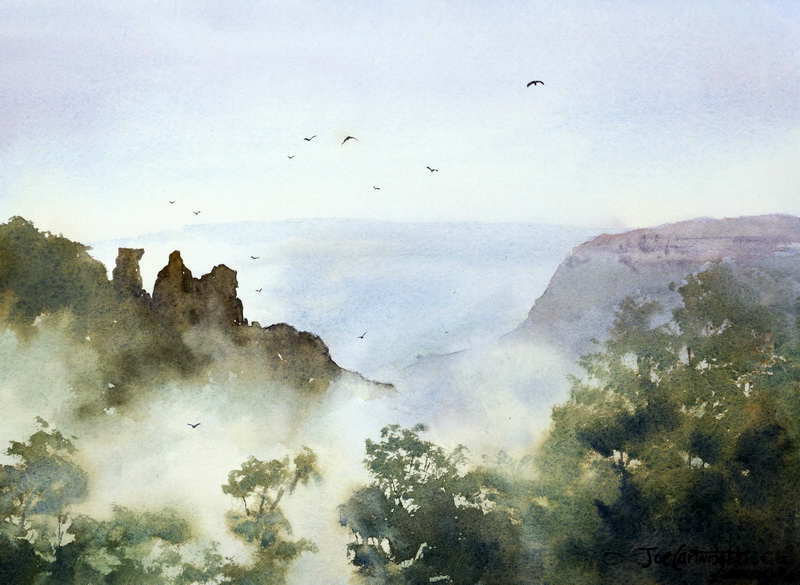 I was recently asked by a reader about how to paint fog with watercolor. Fog is very easily painted with watercolors because it is so simple to create soft edges and light tones with this beautiful medium. If you look at a foggy scene you will notice a number of things. The effects of areal perspective, i.e. 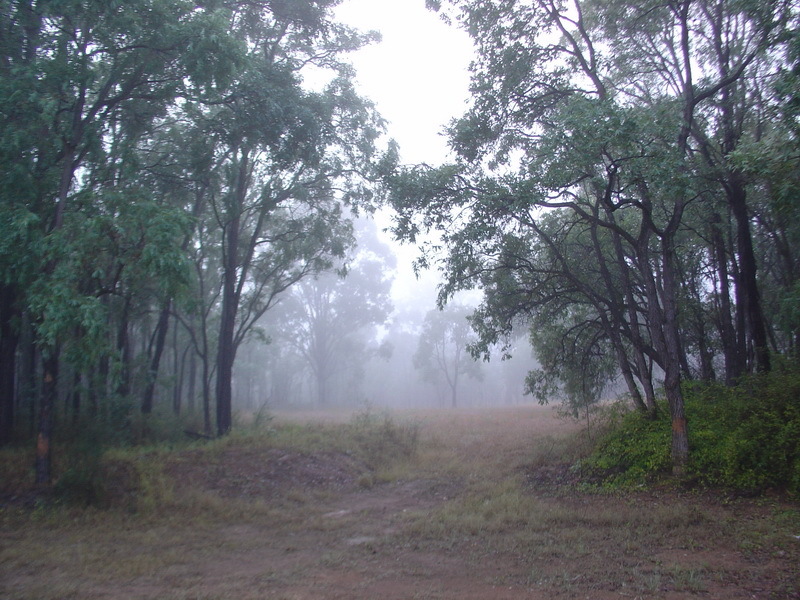 the effect of atmosphere on perspective, are made greater when there is fog or mist. The fog makes distant objects much lighter, the edges softer, and the colors duller. Let us look at these in turn. 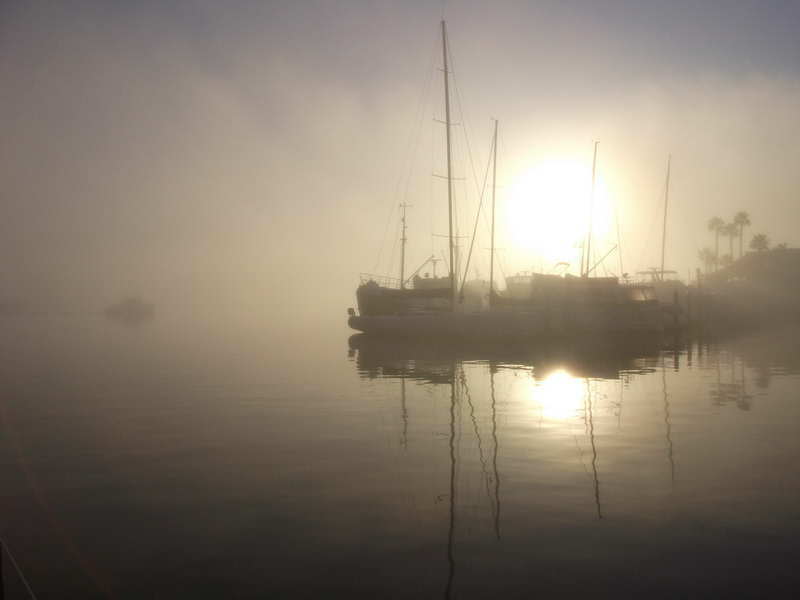 You can see from the photo below of a harbor in fog that the distant boat on the left is much lighter than the boats on the right. The distant boat is also quite a bit less distinct than the boats in the foreground. 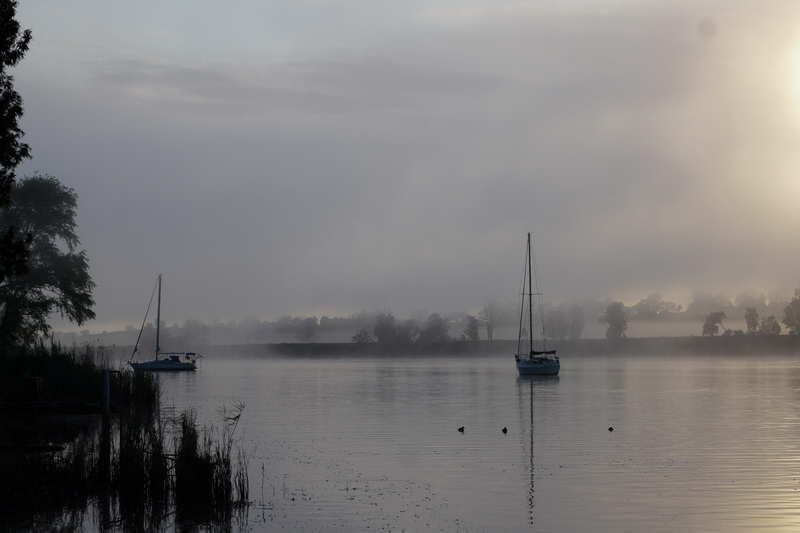 If there was no fog the boat on the left would not appear so indistinct. The fog is making the effects of atmosphere much greater. You can also see that all the colors in this water landscape are much duller than they would have been if there was no fog. Just like in normal atmospheric perspective, distant objects will appear a little bluer than those in the foreground. However because of the fog blocking the blue sky, this effect will not be as great but worth including anyway. Paint the sky area with a very pale watercolor under painting of a light grey. If you are painting a water scene then continue this under painting into the water area. Make sure the water area is painted with stronger tones towards the foreground. Make sure the distant horizon is just a very soft edge, if it is noticeable at all. If you are painting trees in the distance try to paint them in while the sky is still wet so that they have very soft edges. When painting a watercolor landscape use greyer (duller) colors than you would use if there was no fog in your landscape. Do not use bright colors in your painting as the fog would grey them all off. Make your distant objects very light in tone. In fog distant objects are lighter, softer and duller. Make foreground objects sharper, but not bright in color. This will increase the feeling of fog in the atmosphere. 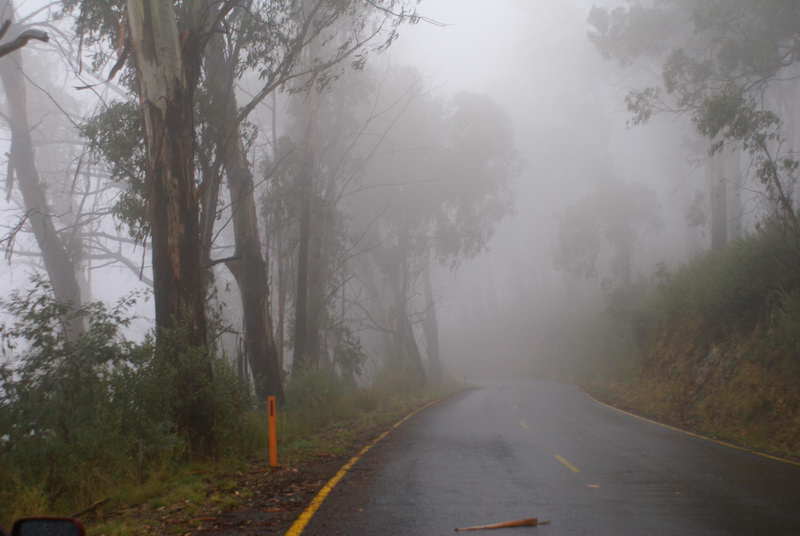 How to paint fog reference photo mountain road. Any shadows will be indistinct if visible at all. However remember to make sure that any shadows are away for the direction of light. 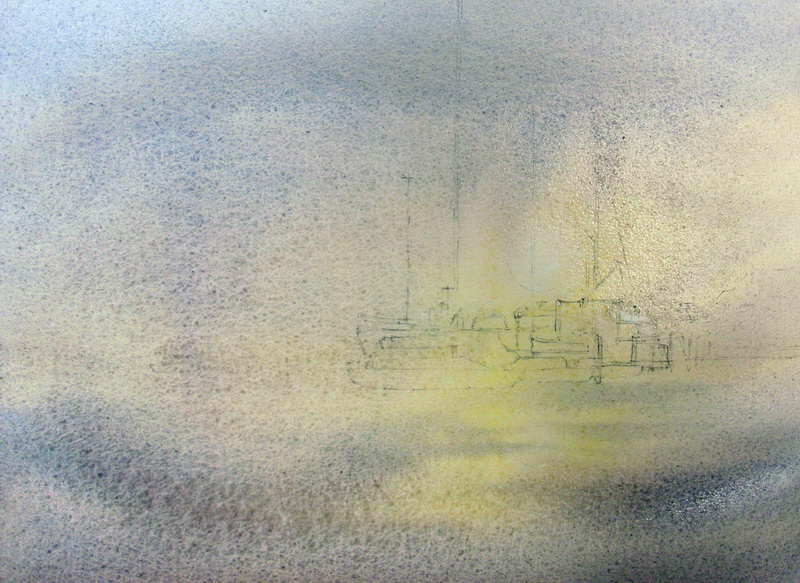 If your watercolor painting has some fog sections and some bright sky areas then you will need to modify the above steps. The fog sections of your painting will use the above information while the sections in bright sky will use normal areal perspective techniques. Next time there is some fog where you live go outside and have a close look at the scene. Nothing will show you how to paint fog better than by spending a little time observing it in real life. Keeping the above points in mind you should be able to observe most of the effects. This will help you greatly when working on your own watercolor painting. Needless to say the same points above apply to all mediums but watercolors a ideally suited to painting foggy scenes. Here is last week’s class watercolor painting. 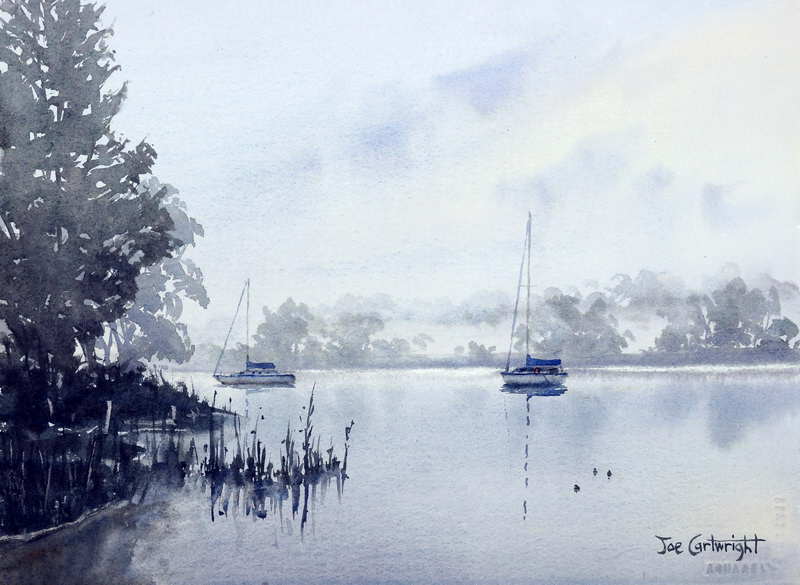 It is based on a photo I took one foggy morning of a couple of sail boats on the Clarence River, before a watercolor workshop I was running in Grafton, NSW. I especially liked the mist on the distant shore which is the subject I wanted to teach my students. Over a 30 minute period the scene went from full early morning sunlight to a misty landscape and back again. It was quite magical to behold. My class had recently done one painting of a misty scene of The Three Sisters in the Blue Mountains so I wanted them to do this one as reinforcement of what they had already learned. Whenever I see a scene like this with lots of soft edges and muted colors I feel compelled to have a go at painting it. This a perfect watercolor painting for me. It is full of wet on wet passages with a small number of wet on dry hard edges. The key to this type of painting is getting the tones and edges right. There is a hill in the distance with fog between it and the distant river bank. This meant that I had to have soft edges below the tree line on the distant hill to give the impression of low lying fog. Paint the sky down to the waterline with a very weak watercolor wash. This should be the lightest area of your painting. It is better to go too light rather than too strong with your sky tones. Notice how the soft could pattern leads the eye into the painting. Let it dry thoroughly. 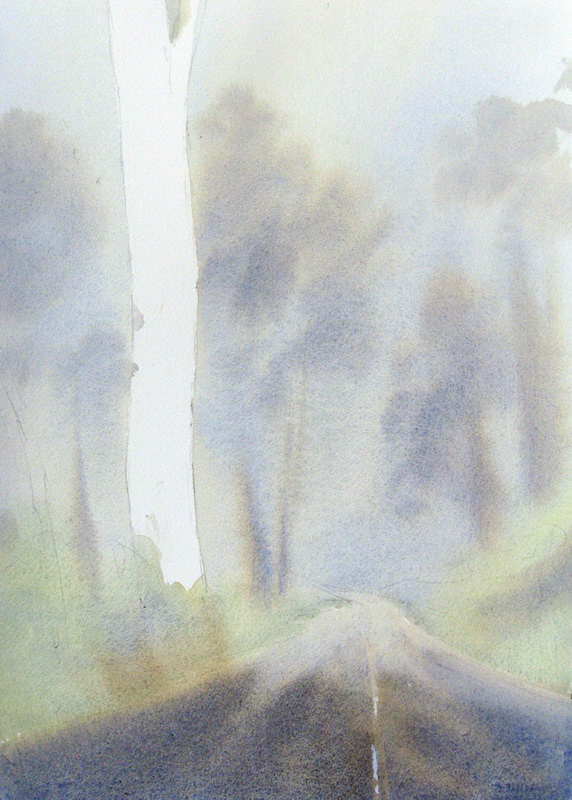 Paint the distant tree-line, soften the bottom edges to give impression of mist or fog. With stronger watercolors paint the distant shoreline. I then painted the trees on the left hand side. First was the lighter distant tree on the right of the left hand group of trees. Then the stronger toned foreground tree was added. While this tree was wet I painted the river bank below it. I scratched a few light edges for posts and parts of the shoreline. I now painted the river, making sure to drop in the reflections of the distant bank in a wet on wet manner. The watercolor painting is finished off with the boats, their reflections as well as the reeds in the water and the close river bank reflection. Remember to keep a close eye on the tones and edges of your watercolor painting. Objects in the distance will be lighter toned and softer edged than those closer. This is even more important with misty scenes like this. Here is my original reference photo I took in case you would like to have a go at it.